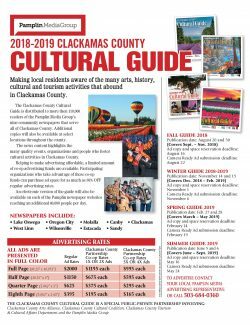 The Clackamas County Arts Alliance and the Pamplin Media Group have partnered to create a unique opportunity in which Pamplin Media Group will produce and distribute a quarterly arts, cultural heritage, and tourism guide for Clackamas County. Future publication dates may vary by one week. Please contact the Pamplin Media Group to confirm.